SUMMARY: Yet another cool lighting product for your case modding project. Just when you think you’ve seen everything under the sun to customize and personalize your PC’s home, someone comes along with an idea that’s totally different than anything else before it. There’s cases that light up, keyboards that light up, fans that light up…. So why not a fan grill that lights up too? The best I can describe the way this looks in person, is that the “flames” rotate by lighting portions of the “grill” in sequence. ThermalTake has a good rendition of it in a Flash format on their website. That’s pretty close to how it looks “in person”. The Fireball grill is constructed of several EL (electro luminescent) sheets, all wired into the inverter. 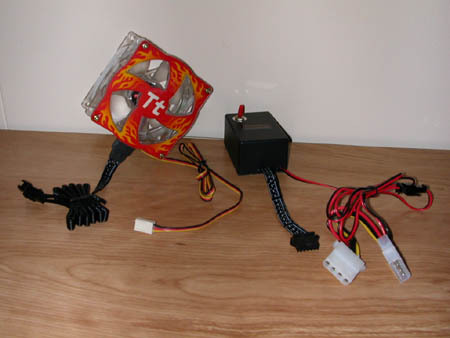 The wiring from the inverter to the “Fireball” consists of six separate lines, connected to each other similar to an IDE ribbon. This “ribbon” is no bigger than a SATA (Serial ATA) cable and shouldn’t interfere with airflow through your case. 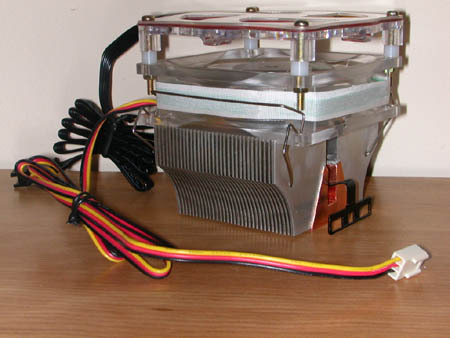 This view shows the various layers of construction and how it looks mounted on a heatsink (Thermalright ALX-800 shown). While mounting this assembly on a heatsink is one use of this product, the components can be disassembled and used separately, if desired. come apart. The actual EL “Fireball” sheet is rather delicate, and there’s four small white plastic spacers that will drop on your feet and bounce across the floor…. You’ve got 30 inches of wire to work with. In all honesty, two and a half feet is more than enough of a lead to mount the inverter anywhere. But, unless you feel like opening your case every time you want to turn the “Fireball” on or off, you’re going to want to mount the inverter externally. Double sided foam adhesive is already attached to the back of the inverter to facilitate installation. Both the EL and inverter power leads have connectors incorporated into them, which makes routing the wires a lot easier. It’s up to you to figure out how you want to route the wires, but I’ll show you my solution. The first thing I did was to disassemble the unit. I then mounted it to my side panel, with the fan on the inside of the plexiglass and the “Fireball” on the outside. I tucked the 6 wire “ribbon” in between the fan and the plexi, routing it into the case. I then swapped out one of the expansion slot plates, with one sourced from an i486 machine I stripped for parts long ago. This used to hold the LPT1 connector. I then routed the leads for the inverter through the plate and stuck the inverter on the back of my case, where it’s accessible yet out of view. While I wouldn’t try to run this particular fan mounted on a heatsink for any serious overclocking (it’s rated output is a tick under 28 CFM (full specs below)), this kit’s versatility makes up for it. You can use the “Fireball” EL part separate, in conjunction with a high output 80mm fan on your heatsink, or as I’ve done here, as a side panel fan. The visual effect it gives is rather stunning, definitely unique. As mentioned, the inverter is quite large, but with 30 inches of wire to work with, finding a home for it really shouldn’t be too difficult. All in all, an inventive idea – well executed – that can be used several different ways. My hat’s off to the guys at ThermalTake, for their creativity. Nice job!! Thanks go to the good guys at ThermalTake for sending this our way.